Scale your business with ease using our intuitive recruitment software to make your daily work more productive and outcome-driven. Place more people and manage the entire recruitment cycle with our high performance and reliable technology. Whether you are in the early stages of your recruitment business, or ramping up the size of your staffing organisation, Adapt fits the bill. Our software connects a powerful recruitment CRM, sales management, searching, sourcing, reporting and business intelligence in a single platform within a dynamic web-based hub. Become more successful with Adapt’s recruitment software that is designed to engender recruitment best practice and fuel your business growth. *Some features may differ according to region. Management information at your fingertips. 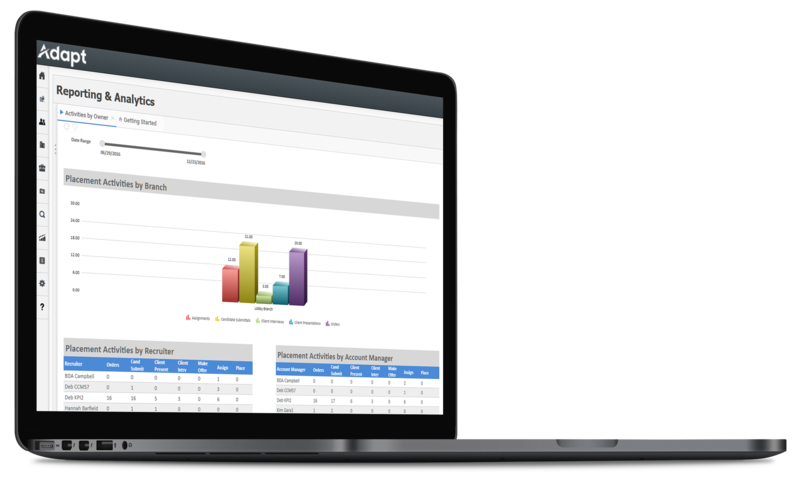 Track and deliver your business objectives with Adapt’s powerful reporting tools and robust business intelligence dashboards. Enhance staff performance by monitoring the metrics that matter most to you. With precise insights you can drive revenue, profits and growth. Keep the recruitment process simple, but highly effective with world-class applicant tracking software capabilities. Ensure candidate and client experience excel, while boosting your recruiters’ performance. Innovative dashboards and smart workflows save time so you can focus on revenue-generating activities. Identify opportunities, increase sales conversion and deepen relationships with Adapt’s intelligent recruitment CRM technology. Mobile optimization allows your sales teams to access vital information from any location at any time, ensuring all account activity is captured and leveraged to grow your business. If you want to be the best in your area of specialism, you need the best recruitment and staffing technology to help you fulfil your ambitions. Adapt will support your growth at every stage, in every sector. ✓ Simplified workflows and one-screen dashboards for greater productivity. ✓ Easy applicant tracking and state-of-the-art sourcing and searching for faster fills. ✓ Better relationship management through comprehensive prospect, client and candidate tracking. ✓ Transparent performance management and insightful reporting for business growth.